I’m not a usual fan of Christmas productions, which often seem overly sentimental and optimistic, but I’ve always enjoyed Christmas itself; the comfort its certainty can bring and the way its traditions are able to unite people and bypass busy schedules. Christmas Crackers offers an interesting take on Christmas productions, deciding against following a well-worn path and instead daring to explore some of the often overlooked experiences of the festive period; loneliness, bereavement and financial struggles. Built from four short stories, each written by a different writer, Crackers explores the central theme of how does Christmas, with it’s often forceful expectations that you have fun and enjoy yourself, translate to those for who life isn’t full of optimism? Clementine’s, the first of the stories, is a powerful exploration of sibling relations, unrequited love and the heart-warming tale that in spite of dysfunctions, bad language, and toilet humour, the family unit can be a hot-bed for love and support; even if those traits are often hidden well below the surface of our relationships. Hidden depth is a theme which carries on through the second sketch Grounded, the most emotive of the tales. Exploring a classic father and son relationship, a one bound by love but separated by a demanding father and a son lost in his father’s shadow, Grounded offers interesting thoughts on where common ground can be found in male relationships. Tear jerking and genuinely tender, it was my highlight of the evening. 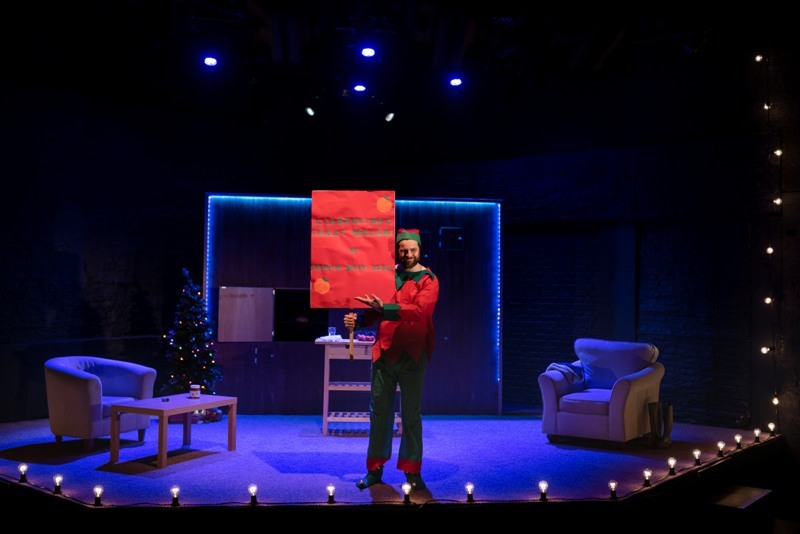 Lighthearted third sketch Home For Christmas provided some relief with a surreal Black-Mirror stylish tale of a homeless, drunken, Santa crashing a play before powerfully-written Marbles explored the aging process, the power of memories and the process of bereavement in the final event. Though it’s unfair to single him out across the evenings 5 strong cast, Marbles provided another powerful vehicle for Micky Cochrane to showcase his ability to break hearts of the audience again in a role well written and soaked in regret. Using Christmas as a central theme to hook interesting stories on, Christmas Crackers took an interesting, and alternative, approach to stories about goodwill and peace on Earth. Four short stories provided both humour and humanity to an exceptional evening’s entertainment. I need to be less cynical. Christmas Crackers continues at Live Theatre, Newcastle until Saturday 22nd December.